In the western movie The Kid a young boy, Rio (Jake Schur), is forced to go on the run across the American Southwest in a desperate attempt to save his sister (Leila George) from his villainous uncle (Chris Pratt). 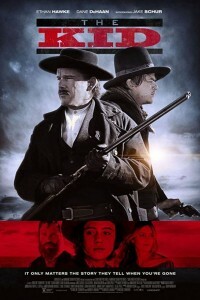 Along the way, he encounters Sheriff Pat Garrett (Ethan Hawke), on the hunt for the infamous outlaw Billy the Kid (Dane DeHaan). Rio finds himself increasingly entwined in the lives of these two legendary figures as the cat and mouse game of Billy the Kid’s final year of life plays out. Ultimately Rio is forced to choose which type of man he is going to become, the outlaw or the man of valor, and will use this self-realization in a final act to save his family.